The secret is this: I use canned tomatoes with green chilies as the base. So simple. I always keep them on hand in my pantry so I can throw this together in no time. 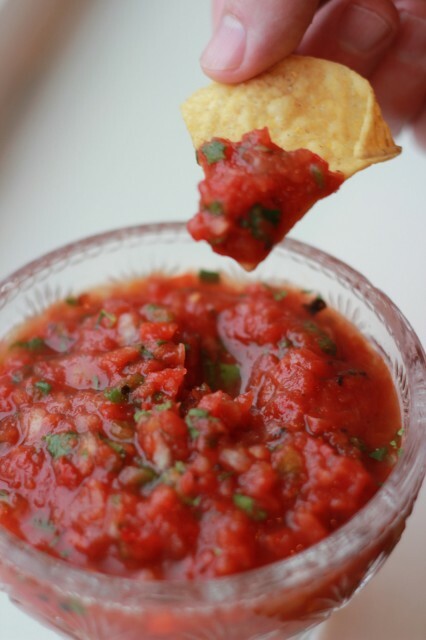 I don’t know about you, but Chips & Salsa has always been one of my favorite foods. I am a sucker for fresh & flavorful Mexican food! Place cilantro, onion, & jalapeno into food processor and pulse until desired size. Add tomatoes, lime juice, salt, and garlic powder and pulse until desired consistency. The flavors combine best after refrigerating for a couple of hours, but I make it and serve immediately all the time because fresh salsa is just too good to resist! I use this salsa on anything – scrambled eggs, salad, with chips, as an appetizer, or alongside any Mexican meal I prepare. Once you try homemade salsa, you’ll never want to go back!